Participants at UnitingWorld’s October 2018 workshop. Photo credit: Pacific Women Support Unit. 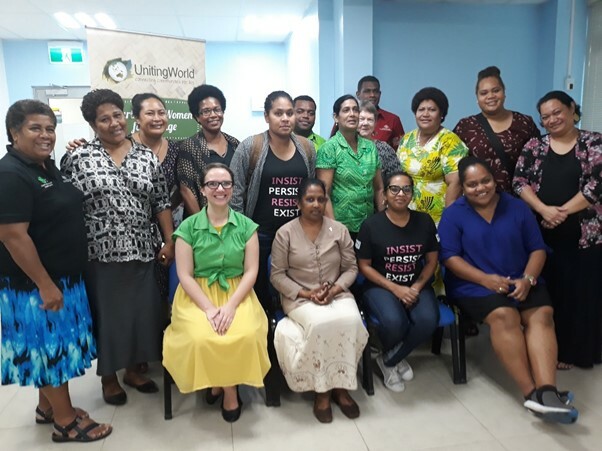 In an effort to broaden its engagement and examine collaboration between faith-based organisations and wider civil society, UnitingWorld recently held a workshop to discuss partnership with Suva-based non-government organisations. The one-day workshop was part of UnitingWorld’s new Gender Equality Theology – Institutional Transformation (GET-IT) project. GET-IT, funded through Australia’s Pacific Women Shaping Pacific Development (Pacific Women) program, aims to improve women’s safety in families and communities and increase their opportunities for representation in positions of church leadership and decision making. The project recognises the vital role that strong partnerships play in realising gender equality commitments in the Pacific Islands region. ‘It’s a good starting point for young people to come to the realisation [of] the relationship between gender equality and human dignity from a biblical perspective,’ said Josaia Tokoni, Fiji Council of Social Services’ Program Officer Volunteer. Ms Calcaterra said the workshop was a valuable opportunity to gather feedback and generate ideas to strengthen their messaging and explore communication channels like edutainment and mass media. The workshop was held on 25 October 2018 in Suva, Fiji. Empowering women economically and in their leadership roles is not only a shared regional responsibility but also a local, cultural and ethical one.